Yes, Duke gets Bagley for one year. Lewis is an athlete. This may mean that Nelson is a no. Would rather get a point guard in 2019, especially Lewis. Has nothing to do with Nelson. He's visiting UD this weekend. Last edited by bcross; 09-21-2017 at 02:38 PM..
Yep, but we have Crosby for two years, so we do not have to have two pg's in '18. Better to get one in '19 to balance the classes. I am always surprised when we get a top 100, but Grant is a new game. Dayton will be in tomorrow to see 2019 @CardinalHayes & @PSACardinals guard Joe Toussaint, per a source. 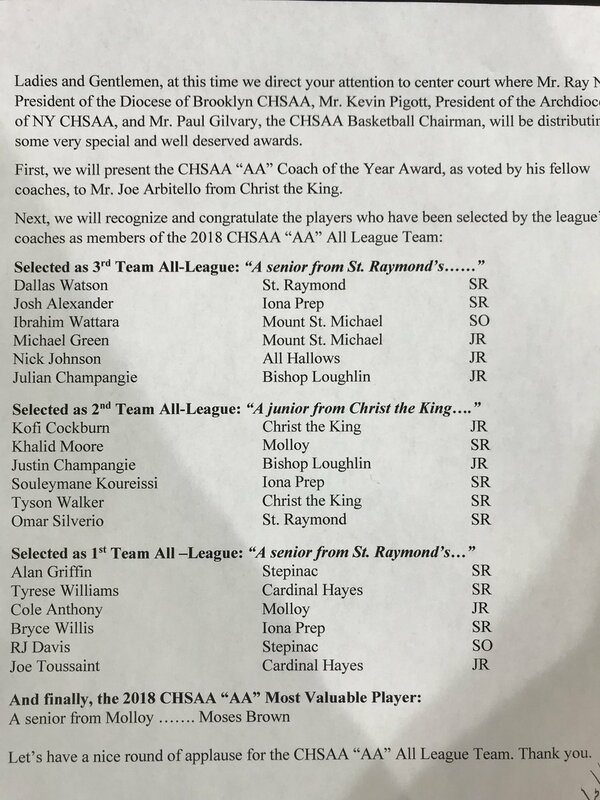 It would be nice to offer the #11 prospect in the country and the #1 PG in the class of 2019 Cole Anthony from Archbishop Molloy who is Cardinal Hayes chief rival in New York. The 5 star 6'2" 165lb Anthony is being targeted by Duke but it would be nice since they stole Luke Kennard from our own backyard if we could return the favor and get this kid! In no way am I suggesting that we can recruit with the likes of Duke, Kentucky, Kansas, UCLA and some of the other one and done schools but many of us have stated that Anthony Grant is raising the bar and is not shy about going after those recruits who previously AM and BG thought were unattainable. I have to admit, as were many other UD fans, that I was surprised to here that Dwayne Cohill stated that Archie cooled off on his recruitment because he said he told him he was too good for us! They didn't steal Kennard from us, he was never coming here. I know that and you know that but would Chris Wright ever had decided to come to the University of Dayton if we hadn't recruited him early and shown a sincere interest in him? Recruiting is often a complicated process! Sometimes, when you get in early on a recruit and show a sincere interest by following up regularly it builds a relationship which is honored late in the process. McKinley Wright, even though he did not eventually come to UD stated that he wanted to play for Archie Miller because we were the first to offer before no one else had heard of him and Tom Ostrum called him almost every day! UD is never going to be able to get all of the local talent to stay home. Luke Kennard's parents had connections to other big time colleges but in the end he thought Duke was best for him. Chris Wright and McKinley Wright were not top 10 recruits. I get all that you are saying, but unless the a kid grew up a UD fan his whole life and his dream was to play at UD, we are not going to keep local kids that are top 10 recruits. We aren't even the top school in our region of the state. While we may steal a few from OSU, X, and UC, right now all 3 are recruiting at a much higher level than we are and typically get the better Ohio recruits. I agree with you! Don May is the perfect example of the point you make above as he grew up a UD fan his whole life and he realized his dream! I also agree that all 3 of the above schools are recruiting at a much higher level than we are mostly just because of the conferences they are in (Big Ten, Big East and AAC). I have a friend who invited me to the X game at the Cintas Center last evening against Hampton in a 96-60 win and I noticed first hand the talent of their recruits, especially the freshmen and sophomores who played a lot of minutes. They have 3 seniors that will graduate but will probably not miss a beat next season! I still would like to see the Flyers make an offer and get into the mix for 5 star PG Cole Anthony from Archbishop Molloy high school in the Bronx. They are Cardinal Hayes (Joe Touissant's high school) biggest rival in New York City. Duke has already signed class of 2018 5 star PG Tre Jones so maybe Cole Anthony may be interested in UD where he could play immediately! Scoochie may even know him and be able to help recruit him. [QUOTE=CvilleFlyer;525033]I still would like to see the Flyers make an offer and get into the mix for 5 star PG Cole Anthony from Archbishop Molloy high school in the Bronx. They are Cardinal Hayes (Joe Touissant's high school) biggest rival in New York City. "Da" comes before "Du", so Dayton should be his first pick. Great. Now Swimming in the kiddie pool? Thinking UD can find a sweet spot somewhere in the middle of the last two posts? i.e. Not going up against Duke and Kansas, but doing a little better than UTSA and Tenn Tech. The best way to get elite recruits is to get on them early and often. The big guys swoop down only after a player has proven his chops. It is to our benefit to court them early before they are on the big guys' radar, and hope that the relationship we build with them eventually win the day. It is the best, if not the only way to compete with elite programs for high level talent. Way to leave out Kansas State to fit your agenda. Don't put Tenn Tech down too much. I don't mean from a prestige standpoint. But look at their recruiting offers. They recruit very hard, send out lots of offers, and aim way high. They have offers to so many top players that we have offered also. And not just us, even bigger fish. I actually view them as a decent barometer. Now I hope we land some that they can't or don't. James Madison (301), UTSA (235), Kansas State(65) and Tennessee Tech (164). How many of those four schools were on everyone's list of destinations Archie would leave for last year (i.e. jobs that would be an upgrade from UD)? I don't have an "agenda" - just think we should be reasonable of what our program is/can be/should be. Not Duke/Kentucky, but much better than those four schools as a collective group. Last edited by 312to937; 02-01-2018 at 08:25 PM.. He also had 33 points and 16 boards in his last game. Let's give him a chance before we just look at his other offers and write him off. Plus we haven't even offered yet - just shown interest. What does where Archie would go have anything to do with recruiting? This is how recruiting works. Lower level schools get in on players early and bigger schools come in later in the game. Basketball recruiting isn't like football recruiting where players start committing their JR year. For 19 recruits, it is still very early in the process. I guarantee if Kansas St. has already offered, he will end up with bigger offers. Also, I believe a kid named Charles Cooke went to JMU and he turned out fine. Curtis told 247Sports that he also considered Cincinnati, Penn State, Toledo and Akron. Outside of UD showing interest, did we even offer him? Does he bring something that Cohill doesn't? Given our limited scholarships "at this moment", I still expect a PG is top consideration, and we have an offer out to Neftali Perez. Not sure what else is potentially on the horizon. Not sure what other offers are out there that are still possible gets...Policelli? This is why UD struggles as a program. A great player in our backyard won't even consider UD. UD has not been able to land great talent for a long time. A diamond in the rough here and there is not proof of great consistent recruiting. Is Chris Mack a great coach? Who knows, but better players make the pressure to develop and outsmart opponents a lot easier. Archie took 3 overlooked players and turned their internal drive into incredible assets. They had defensive intensity that carried them. If they were better offensive players, they never would have looked at UD and perhaps not been as good defensively. That formula worked for that class. Then a class later it did not work. Was Archie a good or bad recruiter? The bigger issue is what coaches have to do to overcome the reputation of UD as not a big time player. This is why UD struggles as a program. A great player in our backyard won't even consider UD. I wonder how hard AG went after Curtis. It's hard to believe he would consider Toledo and Akron but not UD. If you were an 18 year old and the choice was UD or Xavier you would pick UD? Why pick #5 when you can pick #125, and falling, and some wanna "stay the course", expecting better next year. If by "stay the course" you mean not firing the coach after one year then, yes, most want to "stay the course." He was probably late to the game with coaching change. What did he have to offer that was better than X? Archie targeted the players from Wayne and Trotwood early on. They tried to recruit Kenard as a freshman. Travis Ford came into St Louis and got a 4 star PG Jordan Goodwin who was ranked 53rd in the Country. Offers from Missouri, Illinois, Michigan State, Ohio State, etc. Are you suggesting there is something AG can do right now, with this current roster, that makes us top 5? Academics. Going by what one of his family members told me this morning he has some work to do in the classroom. So, AG and others may have backed away on that factor alone, but who knows. I would suggets that at this point there is no "course" to stay on. AG is new, he did hit on a good recruit in his one shot for next year. Perhaps we should wait to see the course, before we decide whether to stay on it or not. but then again that makes for less interesting posts, and cuts down on all the expert opinions. You're absolutely right. There is no future in UD basketball. You should find a different team to root for. Nobody is trying to sell Crosby/Svoboda as the future. With a matured J Davis/Crutcher? Big time. Add to that a healthy Mikesell? Good stuff. Add Cohill to that? Now I'm getting excited. And that doesn't get to X, who could bounce back as a senior, and I expect him to do that to a certain degree. We don't know what Toppin is yet. And we have another Scholarship to fill (which is the point of this thread) - so let's see who that is. So no - not salivating over Crosby/Svoboda (although I think he can develop into a solid bench guy), but I am excited for this teams future. You really need to step back from the keyboard and re-read some of your own posts. In a different thread you are bashing AG. Now you are bashing AM's recruits. Which is it that makes you so miserable? Is it AG or AM's recruits?? Or, are you just a miserable person? For now on, everyone should address you as miserabledog07. You don't deserve the moniker of Maddog. Maddog is atleast a cheap wine that has some value. Last edited by springborofan; 02-08-2018 at 08:08 AM..
Let’s not pretend Curtis wasn’t from Dayton and how excited would we about Curtis. Hes a 3 Star that plays most of his games against bad GWOC teams. He’s a me first player, has an ugly low shot and his teams recird isn’t stellar. IMO AG is after a much higher caliber player. Samari just committed to Xavier, the nation's #5 ranked team...so there's a pretty good chance your assessment of him is...ummmm...wrong. So instead of pretending we can recruit better, let's just admit he's better than we can get. Agree to disagree, rollo! No doubt that when Xavier went to the Big East their ability to recruit went up significantly because of Fox TV contracts, more exposure etc. but I wouldn't go so far as admitting he's better than we can get. I'll put Dwayne Cohill up against Samari Curtis! Who do you think would win one on one? I'm glad you said, "At least for now," because I think we will see Anthony Grant continue to go after the higher rated recruits. Cville, you obviously have a monopoly on the UD recruiting scene and I respectfully and royally kneel to your knowledge and research! All Hail Sir Cville! I have no idea, but as I've said previously, my son played AAU ball with Samari for 3 years so I've seen him practice, play and socialize with players, families and friends...and with that said, feel we missed out by not recruiting him...or at least making a serious attempt. I hope Cohill is as good or better but hope both are studs in college. I have refused to say 'I trust in BG' or 'I trust in Archie' because I don't trust anyone who obviously is here temporarily, but I feel a little different about Grant because I think he's here as long as we'll have him. Because of that, the "At least for now" comment is an admission that he will be able to bring in >3-star players regularly, we just need to be patient. Wow...that's kind of harsh calling him a me first player. You must attend a lot of his games to draw that conclusion. Last edited by Atlantic 10; 02-09-2018 at 09:16 PM..
Every coach is at UD temporarily. Be realistic. If a coach does not have ambition to go to the Final Four or the championship, they are not a good coach. Any coach who can get UD further in the NCAA tournament will be poached by programs that have more resources and better chances to win the NCAA. If nobody wants your coach, that is bad. BG and AM were very loyal to UD. They held their positions with class and I never heard either one ever say a bad thing about the University. In fact, AM promoted the university and university name constantly. He even praised UD at his IU news conference. Yes I’ve been to his games and know a majority of the coaches in the area and that’s where I drew my assessment as well as grade issues. As I said I hope he does well but I think AG is after a different type of player and not settling for a 3 Star. Good things are on the horizon. Last Thursday, Feb. 8th, Zimife Nwokeji 6'7" Jr. forward from Maclay School in Tallahassee, FL committed to Florida St. via twitter. Tre Mann’s team, The Villages Charter, TVC for short, was defeated by Miami Christian back on Jan. 26th by the score of 92-61. Tre went for 32 points and was 6 for 13 from the three point line! He shoots 90% from the free throw line on the season! Neftali Alvarez, a senior who we have offered scored a ton of points as well! Tre has to do it all for his team because he doesn’t have the supporting cast that Neftali has at Miami Christian. If you like to watch you tube videos the whole game is there! One thing I noticed while watching the video was that both players dribble the ball real low to the floor (the complete opposite of John Crosby with his high dribble)! I am really impressed with both players! If we were to land Alvarez for next season Mann would be icing on the cake for 2019! I have a sister and two cousins who live there and I think you may have to be 55! You may be right though! One way or another they have to have schools in the Villages for the employees families etc. I know they always say that the A10 is a guard-centric league. And we certainly have our oar in the water on some good ones. But when are we going to see an All-league First Teamer that has good skills and is 6'10" and weighs 245 that has Dayton on his fav list? Cohill ooshing a J for Holy Name. Game ongoing right now. Tied at 14 after 1st period. Class of 2019 guard Tyson Etienne from Long Island Lutheran in New York has emerged into a high major prospect this high school season. Etienne transferred to Long Island Lutheran this year. Etienne is now up to eleven offers and is starting to pick up interest from some bigtime programs. Amari Davis – ’19 SG Trotwood Madison: Davis capped a tremendous tournament run, in which we watched him dominate two regional games, with back-to-back twenty point games in Columbus, as his Trotwood team was bounced by Akron STVSM for the second time in as many years. A 6’2 bouncy athlete, Davis is a high-wire act who can dunk on you driving to his left at any time, while also being his team’s best perimeter defender and playmaker. Most of his game revolves around his athleticism and passion, but Davis has been a winner on all level and has he fine-tunes his skill-set expect his offer list, which already includes many mid-major D1 programs, to continue to grow. Top 2019 PG Andre Gordon from Sidney has decided to concentrate on Basketball in College, which is huge for us because he is a two-sport star. Wonder if we'll get another shot at Samari Curtis? I would take him in a minute. Oh my, check out the vertical on Andre Gordon. He must have a 44" vertical about him. This young man is exciting. He would have the arena rocking and rolling. I have to say he is one of the finest point guards I have ever seen at the high school level. Looks like huge upside potential at any D1 program. And we're close to home - his mom can see him play every home game of his career! If we don't land him, can we at least get those jerseys??? Sounds like Steele may have been the lead recruiter on Curtis. "I really like their style of play and the atmosphere there is amazing. The coaches are great," Bertram tells me of Dayton. Virginia, Washington, Stanford, Kansas State, Oklahoma State, Georgia Tech, Syracuse, and Providence are other high-major programs expressing interest. Any kid considering Louisville, Arizona, or Mich St is taking a big risk. 2019 Andre Gordon is currently having an in-home with Illinois State, per source. Will visit Dayton tomorrow. Lock him down now, I saw the kid a few years ago and thought he would be a real stud someday. I realize Dayton is the biggest name after him right now per Verbal commits, but give him a year at Huntington with the exposure they get and my hunch is his stock will soar. As a side note, here is another kid Grand Canyon is after. I think for 2019 the Flyers are looking at Tre Mann, Kira Lewis, and Andre Gordon. If you could have any of the three, which one would you want? Gordon is a well built leaper with a poor handle. Three mis-handles dribbling on a highlight tape? Right now he is not a great talent, but if he explodes at Huntington, he will be looking at bigger schools. If not, do we want to beat out Kent St for his services? Kira Lewis is a decent size scorer and shooter with average leaps and athleticism. Tre Mann is my pick, hands down. At 6'4" and room to fill out his frame, he is the complete package, good handle, good passer, good shooter and good leaps and athleticism. You can see he has the size and skills to be a very good defender. Last edited by jack72; 04-17-2018 at 10:34 AM.. Wait on another thread I heard that the stature of the school a transfer comes from doesn't matter, so does it matter in recruiting the stature of other schools that are looking at him??? Maybe we should wait until he goes to Kent St. for a year and then wants to transfer. To me, all three are no brainers... no doubt. Again, to me none impact the offers of the others. Now, they may have different view. But man, could you imagine the back court with those 3 plus Jalen and Jordan? I am older but I don't recognize the initials TMC. I agree with your comments as I would believe it would be Nova worthy as well but I think it is a disservice to leave Dwayne Cohill out of the conversation because he may prove to be the best guard of them all! That being said, I really like Tre Mann and he is my pick after looking at the various you tube videos because that is all we have right now. Run TMC - Golden State Warriors in the early 90's. T was Tim Hardaway. M was Mitch Richmond. C was Chris Mullin.